A diagnosis of breast cancer can be overwhelming. That's why the Breast Care Center at Summerlin Hospital Medical Center has a nurse navigator who is dedicated to guiding and supporting you and your family through the screening, diagnosis and treatment of cancer and other medical conditions of the breast. The navigation program is available to you as a free service. Laura is a registered nurse who is certified in perioperative (OR) nursing from the Competency and Credentialing Institute (CCI). 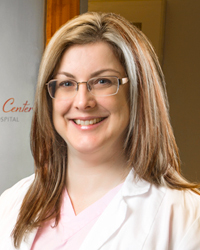 She is a graduate of the State University of New York (SUNY) and has an extensive background in breast surgery and reconstruction, as well as knowledge in oncology nursing. To make an appointment with our nurse navigator, please call 702-233-7155.